There is never a day, not one single day, where I don’t think about what happened on this day three years ago. It was such a dramatic event for our family. It was horrible. Gut-wrenching horrible. Yet, it was beautiful too. As horrific as it was, it was even more beautiful. Today is the third anniversary of Kidney Day. The day my hero wife donated her kidney to my son. Though I would never wish for them to go through it again, I praise God (literally) every day that they did. Three years later, Karen is doing well. You can live a normal life with one kidney. Other than the fact that she can't take Advil, she doesn't have any limitations. Sawyer is doing well too. He still copes with the progression and effects of the genetic syndrome that killed his kidneys, but this will not impact his new kidney. It has been a great year for him. He went the entire year without spending the night in the hospital. As soon as an organ is transplanted into a person, the body begins to reject that organ. This is why transplant recipients have to be monitored often, face multiple transplant surgeries if they live long lives and they have to take anti-rejection medicines every day for the rest of their lives. We praise God because Sawyer's kidney is strong and thriving! We have a great God who picked the perfect donor… who happens to be gorgeous… but I digress. The only "hiccup" post-transplant is the transplanted ureter. We still face the possibility of having to surgically re-implant it, but Sawyer's doctor is exhausting other ways of addressing it first. We are so grateful for the love and care he receives from his doctor and the rest of the awesome professionals at the Children's Hospital of the King's Daughters. One of the highlights of Sawyer's year was basketball. 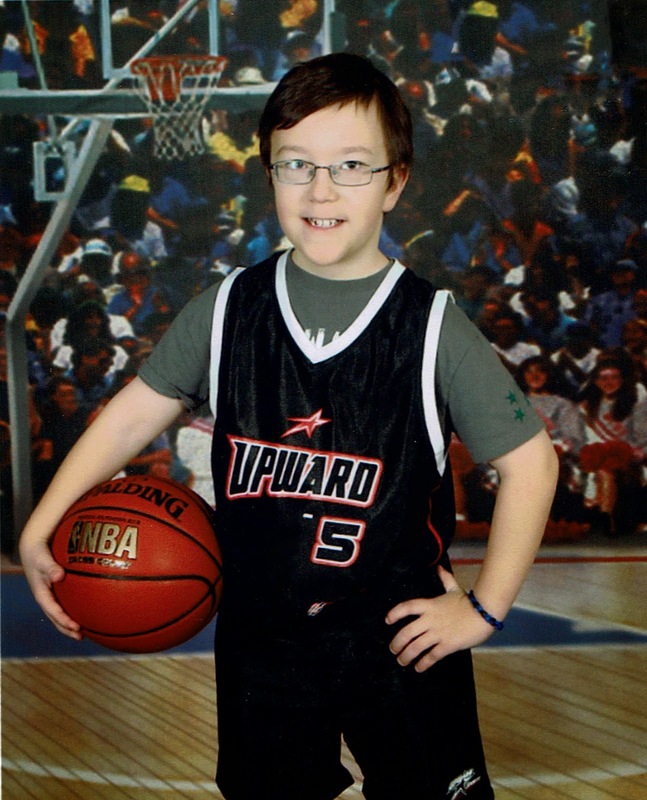 Sawyer fell in love with basketball before he could hardly walk. This year he played on his first team and had a blast. We see a lot more basketball in his future. Sawyer reached another milestone recently. In the last two months, Sawyer started taking all of his medicines by mouth. Shortly before transplant, Sawyer had a "G-Tube" surgically implanted into his abdomen. Many young children who receive a transplant have to get a "G-Tube" to ensure they will get their anti-rejection medicines when they do not cooperate taking them by mouth. Sawyer was definitely one of those kids who would not cooperate, but he hasn't missed a dose by mouth in over a month. Today we celebrate with a shopping spree at Toys R Us and we hope to have the g-tube removed in the near future. Kidney Day is synonymous with New Life Day in our home. Sawyer's new (47 year old) kidney has given him the opportunity to live a new life free of dialysis machines and full of basketball (and Doritos andchocolate milk and…). We can't even begin to thank God enough for giving us this year. We are also grateful beyond words for the many people who continue to pray for Sawyer and pour into his life. God has done much through you. We would never wish this path for our son or anyone else's son or daughter, but God has not abandoned us on this journey. He takes something horrible and makes it beautiful.